This Milan classic combines the skills with a talented local chef (Carlo Cracco) and the city’s top gourmet food store (Peck). 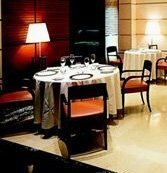 Within three years of opening, Cracco-Peck boasted two Michelin stars. Specialties include Milanese classics revisited — Cracco’s take on saffron risotto and breaded veal cutlet should not be missed. Be sure to save room for the light, steam-cooked tiramisù.The gourmet menu offers good value and relief for the undecided. Reservations essential. Prices are not for the faint of heart. If you must ask, do not enter. Closed for three weeks in January and July.